Adult whitefringed weevils are 10-13 mm long, slate-grey with a distinctive white strip on each side of the wing covers. Larvae are found in the soil. They are up to 13 mm long, are legless and, have a grey-white body. Their large black jaws are clearly visible but the yellow brown head is generally not seen as it is retracted into the body. Minor pest in many pastures and crops. Found throughout the North Island and much of the South Island. Adults feed on the leaves of a wide range of broadleaf plants. Larvae feed on the roots of many plants and are the most damaging life stage. Whitefringed weevil originates from South America but has been present in New Zealand since the 1940s. The flightless surface dwelling adults occur from late spring through to early winter. All adult whitefringed weevils in New Zealand are female with reproduction occurring via parthenogenesis. While adult weevils can potentially lay over 1000 eggs their diet plays an important role in their overall fecundity. When fed ryegrass only 20-30 eggs are laid but with legumes such as lucerne and clover they will lay 300-400 and when fed peanut leaves they will lay over 1000 eggs. The adults begin laying eggs 5 to 25 days after emergence from the pupa. Eggs are initially milky-white when first laid but change to dull light yellow. They are very small (<1 mm diameter) and laid in groups of 12 -60 in a gelatinous mass that hardens after drying causing the eggs to adhere to soil and litter, making them difficult if not impossible to see. The eggs hatch about 2 weeks after rain or irrigation. 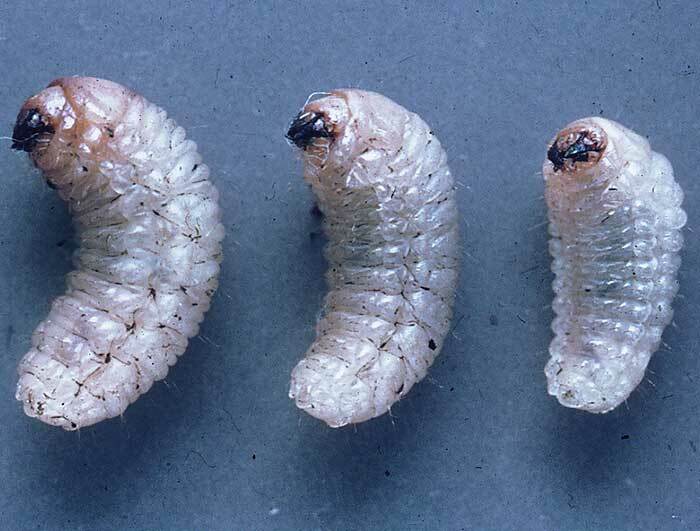 The larvae have 11 larval growth stages (instars) all of which are found in the soil. They are legless, have a grey-white body and large black jaws that are clearly visible. The yellow brown head is usually unable to be seen as it is retracted into the body. The first instar larvae do not feed but are able to survive for several months before moulting to the second instar which commences feeding on plant roots. Larval development takes between 8 and 24 months with fully grown larvae reaching about 13 × 6 mm in size. These are the most damaging stage. The larvae can feed on a wide range of plants and there is some evidence that larvae grow more quickly when feeding on a preferred host such as white clover. Pupae can be found from late September-early April in oval chambers 5–15 cm deep in the soil. Pupae are white, 10-12 mm long and turn brown just before adults emerge. 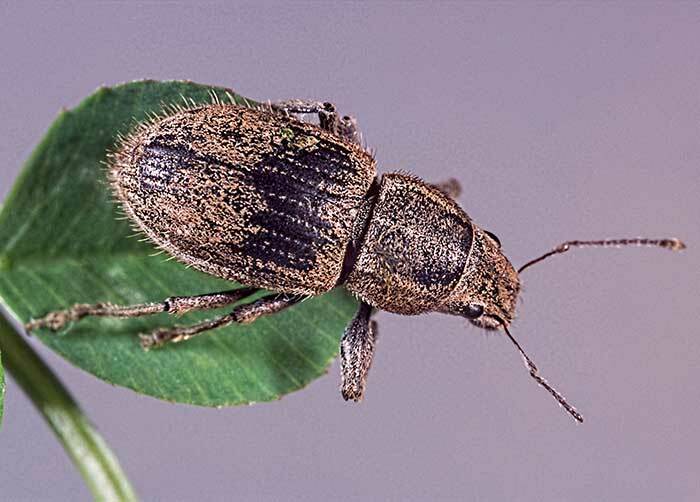 In New Zealand, larvae have been recorded damaging lucerne, pastures, forest seedlings, horticultural crops and grape vines. As a consequence of larvae feeding on the roots plants become weakened, wilt and eventually die. 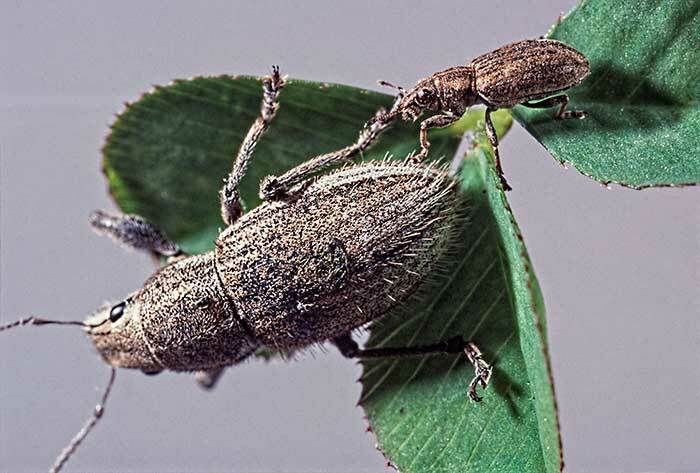 Adult weevils feed on a wide variety of plants leaving notches on the foliage but this seldom causes economic damage. Insecticides are unlikely to give satisfactory control because larvae of whitefringed weevil are extremely tolerant to most of them. If whitefringed weevil larvae are present in an area where susceptible crops are to be grown forward planning can limit their impact. Intensive cultivation (three rotary hoeings at weekly intervals) followed by a summer cereal crop can reduce numbers sufficiently to enable succeeding susceptible crops to be grown.